Holland Colours (“Holco”) is a tiny Dutch manufacturer of industrial coloring agents and pigments. The company has high employee ownership, operates in a profitable niche market and produces consistent free cash flow, all things I love to see in a company. Holland Colours also trades at a undemanding multiple of earnings, pays a generous dividend and has room for growth. Holland Colours was founded in 1979 in Apeldoorn, Netherlands. The company’s first product (and still its major source of revenue) was Holcobatch, an easy to use coloring agent for use with plastics and other synthetic materials, especially PVC. 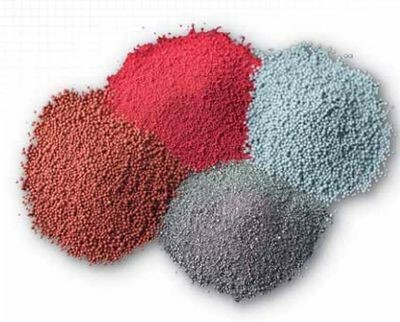 Holcobatch can be used to create practically any color imaginable, and is simpler to handle than powder pigments and liquid dyes. Holland Colours also produces Holcoprill for other plastics and Holcosil paste for silicone products. The company’s largest customer is the construction and building industry, which uses the company’s products to colorize PVC pipes, door and window housings, siding and other plastic components. Holco’s products are also used in packaging, as well as in silicones and elastomers like sealants and rubber, and finally in specialty applications like polystyrene foams and fibers. Since its founding, Holland Colours has grown into a worldwide company employing around 400. The company has manufacturing facilities in the US, Europe and Asia. Holco’s product lines are not long-term high-growth industries , but demand should generally increase in line with world GDP over time. As always, low long-term growth is neither automatically good nor bad. Low growth limits potential company profits, but also discourages new suppliers from entering the market and reduces the chances of innovative disruption. The financial crisis took a toll on Holco’s revenues and earnings, but the company has fully recovered. The company manages a healthy gross margin in the mid 40s, and also converts an impressive proportion of its net income to free cash flow. Here’s a look at the company’s results since 2007. All figures are in millions of Euros, and will be for the entirety of this post. Trailing twelve months results remain slightly below 2011 earnings, when some pent-up demand combined with low materials costs gave Holco some additional earning power. However, the company’s EBIT margin has nearly caught up with pre-crisis figures. From 2007 through fiscal 2013, total net income to free cash flow conversion was 148%, with EUR 16.3 million in free cash flow from EUR 11.0 million in net income. 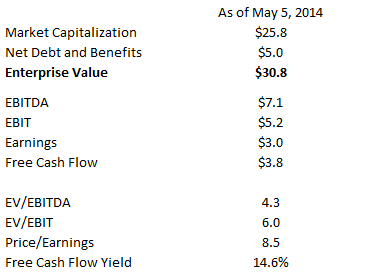 So where did all that excess free cash flow come from? The answer can be found by comparing Holco’s historical depreciation and amortization with its historical capital expenditures. From 2009 to 2013, Holco seemingly underinvested in its long-term assets, with annual capital expenditures coming in well below recorded depreciation and amortization. Ordinarily, this might be cause for concern. After all, a company that continually underinvests in necessary physical assets will eventually see its competitive and financial positions eroded through production delays and costly repairs. But I don’t think that’s the case with Holland Colours. For one, the company’s main source of revenue, the European building and construction industry, has struggled mightily for the past several years. In times of low utilization, physical plant wears out more slowly and may not require replacement at the same frequency. Second, Holcobatch production has been going on for decades, and the process is unlikely to change, requiring new machinery or facilities. Combine depressed utilization and a stable production process and you get low capital expenditure requirements. Regardless, Holco management has now reversed the low capital expenditure trend, investing 1.15x the amount of depreciation and amortization in capital assets for the twelve trailing months. Holco has used its copious free cash flow to chip away at its debt, resulting in a much more stable and sustainable company. Should another crisis or extended recession come along, Holland Colours will likely fare much better than it did the last time around. Now for a look at Holco’s valuation. As I write, the company has a market cap of EUR 25.8 million. However, only about EUR 5.8 million worth of shares are free floating. Just over half the company’s shares are controlled by Holland Pigments BV, in which many Holco employees are invested. (In all, Holco employees own 21% of the company.) Various other institutions own large blocks of shares, leaving only 22.6% of the company’s shares available for investment. The micro float of an already microcap company may partially explain Holland Colours’ low valuation. Generally speaking, buying consistent free cash flow generators with defensible business models at single digit EBIT/earnings multiples tends to work out well, whether or not a company experiences revenue growth. Either revenue growth does occur, operating leverage kicks in and the value of the company increases without multiple expansion, or market perception changes, and the company is awarded a higher multiple of the same steady earnings and cash flow. Ideally, both processes occur at the same time, and that’s where investors can really make some great returns. At the moment, Holdco’s valuation may be held back by the market’s perception of its home Eurozone economy: financially strapped, with little growth and with no recovery in building and construction within sight. However, Holland Colours actually generates more than 75% of its EBIT in the healthier economic climates of the Americas and Asia. Year by year, Holco has been reducing its dependence on the struggling markets of Europe and building its business in the Americas and Asia. While the company still receives more than half its revenues from Europe, this figure is down substantially from 2008. Asia’s contribution to revenues nearly doubled from 2008 to present, while the Americas rose slightly. While Europe’s significance to Holco’s revenues has decreased, the region’s significance to EBIT has truly plunged. In 2008, Europe accounted for over half of Holland Colours’ EBIT; now, it account for less than one quarter. 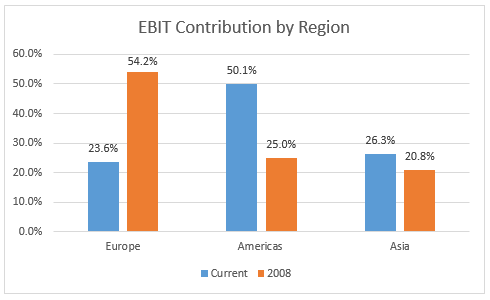 The Americas (chiefly the US and Canada) have come on strong and now account for more than half of Holco’s EBIT. Asia contributes more, but not in proportion to its revenue growth. Holco has had some sales and profitability issues in China, but is attempting to address these through better staffing. While Holco’s European operations struggle to earn an EBIT margin of more than a few percentage points above breakeven, the Americas segment is ticking along at an EBIT margin of 11.9%, while Asia is at 13.5%. There are a few possibilities here that could result in greatly improved profits for Holco. Europe continues to struggle, but Holco’s focus on Asia and the Americas continues to pay off. European revenues soon dip below a 50% share and continue to fall, eventually leading the market to recognize that Holco should no longer be given a Eurozone valuation. Europe’s long-awaited economy recovery arrives, complete with a resumption of normal building and construction activity. European revenues and profitability take off, complementing the company’s successful international operations. Either scenario would result in greatly expanded profits and likely, a large increase in the value of Holco stock. On the other hand, slowdowns in Asia and the Americas with a continued European malaise could result in returns to 2008/2010 level results, though Holco’s lower indebtedness would somewhat reduce the sting this time around. While they wait to see which scenario plays out, investors will be well-rewarded in dividends. At the current price of EUR 30, Holland Colours yields 5.7%. Alluvial Capital Managment, LLC holds shares of Holland Colours NV for client accounts. Like most of the time, a great article Nate! and this time a company from my motherland, definetly going to analyse this company. Thanks for the lead! From scanning briefly through the company’s annual reports along the last decade and a half, it seems as the business didn’t grow at all. For example, shareholders’ equity in 1999/2000 was 20.4 m Euro, and in 2012/2013 it was a mere 24.9 m Euro – CAGR of a measly 1.5%. It’s not due to shares being issued in abundance – the outstanding shares count is exactly the same today as it was back in 1999/2000. A part of the answer is a generous dividend payout ration along all of those years, between 50-100%. That means of course that the growth outlook for this business is quite depressing. Oh I won’t argue that the company has superior growth potential. It operates in a small (though quite profitable) niche. Remember, however, that the company’s largest end market, building and construction, underwent perhaps the greatest upheaval since the Great Depression over the last half decade. I actually think it’s remarkable that the company is already back to where it was before the crisis. It’s also important to note that the company was once a Europe-focused operation, but now earns the majority of its profits in much faster-growing economies.